Sometimes a recipe just catches your fancy and you want to make it immediately. I saw this baked rice recipe on bonappetit.com and added everything to my shopping list right away so I could make it that same night! It’s so colorful and has many flavors I love – salty, sweet, tangy, minty. Oh, and there’s some butter. That always increases the deliciousness factor! I also was curious about this baking method for rice. It worked perfectly and now I plan to try it using other herbs – like maybe some dill, and then you could serve it with some delicious salmon, and… I’m getting carried away. I adapted this recipe from a Yotam Ottolenghi recipe for Bon Appetit. I like the way his recipes feature unusual flavors and ingredients. If you can’t find pomegranate arils, you could finely chop some dried cranberries instead. I was lucky and got my pomegranate arils already separated from their pomegranate, but if you need to seed a pomegranate, there appear to be two methods: Cut it in half and bang on the back of it with a spoon, OR submerge it in water and pry it apart, and the seeds sink while the rest of it floats. I got my pomegranate molasses from Amazon. And guess what? You can also use it to make these awesome carrots! Equipment: Baking sheet, broiler-safe 9" x 13" baking dish, aluminum foil, medium bowl. Roast the nuts: Preheat the oven to 350 degrees F. Spread almonds in a single layer on a baking sheet; roast for about 5 minutes, or until just browned. Set aside to cool, and preheat the oven to 450 degrees F.
Bake the rice: Did you preheat the oven to 450 degrees F? Just checkin'. In your broiler-safe 9" x 13" baking dish, combine rice, water, and ¾ tsp. kosher salt, and mix well. Dot the small butter pieces evenly over the top, lay mint sprigs over all, and cover tightly with foil. Bake at 450 F until water is absorbed, 30-35 minutes. Remove from oven, pluck out the mint, and fluff the rice with a fork. Admire your minty rice. Wasn't that so easy? 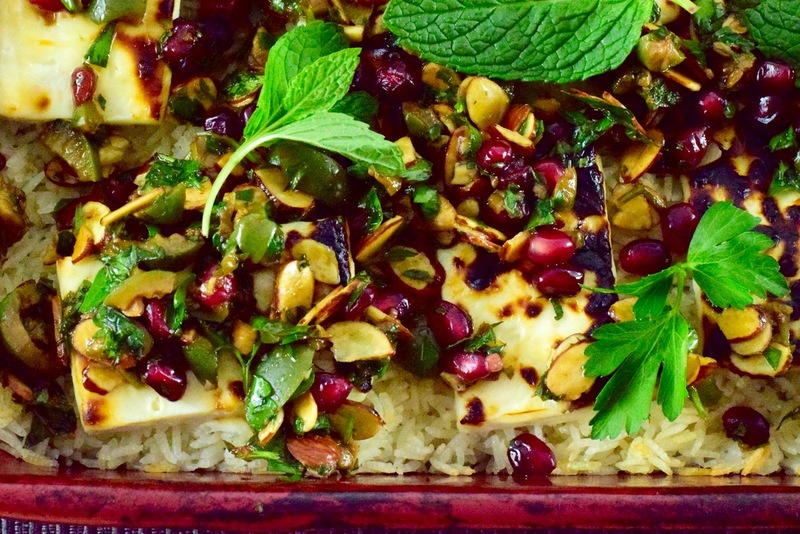 Make the topping: While the rice is baking, combine the toasted sliced almonds, pomegranate arils, olives, olive oil, chopped mint, chopped parsley, pomegranate molasses, and garlic in a medium bowl. Season with salt & pepper to taste. Assemble & serve: Once the rice is ready, preheat the broiler, and arrange the feta slices over the top of the rice. Broil for 5-10 minutes (mine only took 5) until the feta is starting to brown and the edges of the rice are starting to crisp. Remove from oven, spoon minty pomegranate topping over, and enjoy!